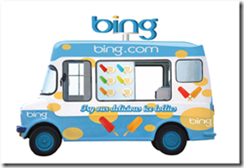 As a way of promoting Bing Maps Microsoft are sending out an ice cream van around London this summer. Unlike with the Jimmy Choo game, and even the street food trucks in the US, they're publishing a schedule in advance, so you'll know where to go. In fact in some ways it's a bit of a tour of agencies around London, with stops at Shorts Garden, Westbourne Terrace, Charlotte Street and Golden Square (but not Parker Street - yet). See the schedule on a Bing map here.